2019 Championships in Co Carlow! The NPA Managing Director Anna May McHugh was delighted to announce yesterday evening at the ‘Ploughing Prizewinners Banquet’ that the 88th National Ploughing Championships will be held on a superb, centrally located site in Co Carlow from September 17th to 19th. The site was confirmed as the ideal location for the 2019 Championships at the prize-giving ceremony attended by over 500 in the Bridge House Hotel, Tullamore, Co Offaly. 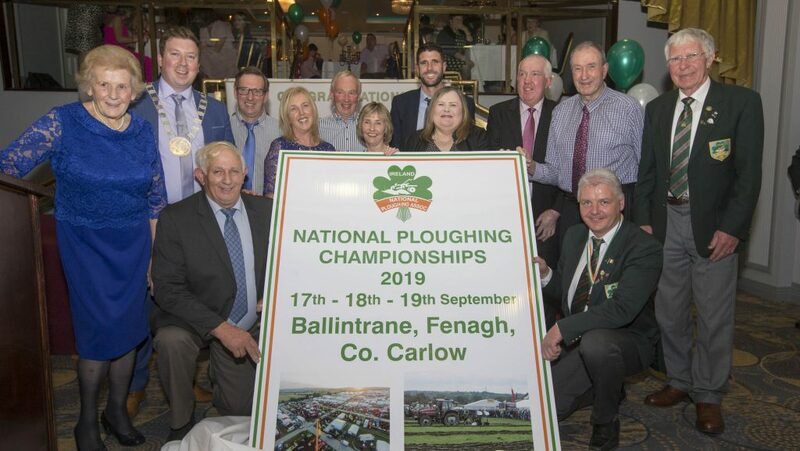 Speaking after the announcement the NPA Managing Director Anna May McHugh said “We are delighted to be staging the event in Ballintrane, Fenagh, Co Carlow, as the site has all of the criteria to qualify it as an excellent place to stage next year’s ‘Ploughing’. “I would also like to take the opportunity to thank the people of Offaly for all of the goodwill and support for the last three successful years, when the event was held in Screggan, Tullamore, Co Offaly. Announcing Ballintrane, Fenagh, Co. Carlow as the venue for Ploughing 2019 are Landowners with Anna May McHugh, NPA Managing Director; Cathaoirleach of Carlow County Council Brian O’Donoghue; Kathleen Holohan, Chief Executive of Carlow County Council and Carlow ploughmen Eamonn Treacy (World Conventional champion) and John Treacy at the Ploughing Banquet and Awards in Tullamore, Sunday 7th October 2018. Current World Ploughing Conventional Champion Winner Eamonn Tracey from Carlow will again represent Ireland in next year’s World Ploughing Contest in the USA. And silver medal winner John Whelan from Wexford will take part in the Reversible Class.